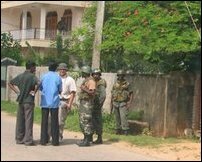 University students protest at Kaladdy in Jaffna turned violent when Sri Lanka Army (SLA) soldiers fired at the air and tried to disperse the protestors. The Scandinavian ceasefire monitors who tried to calm the situation had to withdraw from the site at 12:30 p.m. as they were unable to persuade SLA commanders and student leaders to come to an understanding to defuse the situation, sources said. The students protested in support of the demands put forward by the Hartley College and Methodist Girls College students, Point Pedro, against the expansion of Sri Lankan checkposts close to the colleges premises. 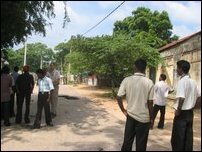 The protests which spread to other parts of Jaffna district shut down the educational institutions. Student leaders on Thursday vowed to expand the protests in Jaffna and set-up road block at Kaladdy Junction. More than 300 troopers were rushed to Kaladdy area in an attempt to quell the protest. The soldiers confronted the students attacking them with gun butts and by firing tear gas. Finally the soldiers started firing in the air. Ceasefire monitors who rushed to the site tried to calm down the student leaders but left as SLA rejected students' demand to remove the commandos who attacked the protesters from the site. Student leaders protested to SLMM officials stating that they were being targeted and blocked from exercising their right to protest against the Government of Sri Lanka and the "occupying" forces. They demanded that the soldiers who blocked their non-violent with viloent response, should leave the scene to bring normalcy in the area. Tension further escalated when SLMM left the site as the troopers began to beat civilians and blocked all traffic along the Palaly Road and its byroutes between Thirunelveli Junction and Kantharmadam Junction. One kilometer long strip of the Palay road remained completely blocked for civilian access causing more than hundred family members in the area unable to reach their homes. Vehicular traffic took circuitous routes to avoid blocked roads. Meanwhile, the Norwegian Ambassador to Sri Lanka Mr. Hans Brattskar, who visited Jaffna Thursday held discussions with the Government Agent of Jaffna Mr. K. Ganesh, SLMM officials and the Sri Lankan military officials at Palaly military complex. He left for Vanni via A9 route. He was not provided SLAF helicopter as he was not visiting Jaffna and Vanni as a facilitator to the peace process, but as an Ambassador to Sri Lanka, according to military sources in Jaffna. The Norwegian Ambassador said that the Norwegian goverment and the scandinavian monitors were doing whatever they can to bring normalcy in the NorthEast, sources in the Government Secretariat in Jaffna said.